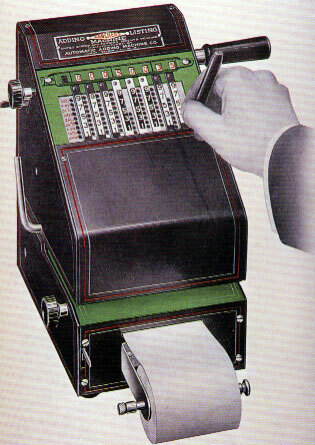 The Golden Gem adding machine enjoyed a long sales success through the first half of the 20th century. 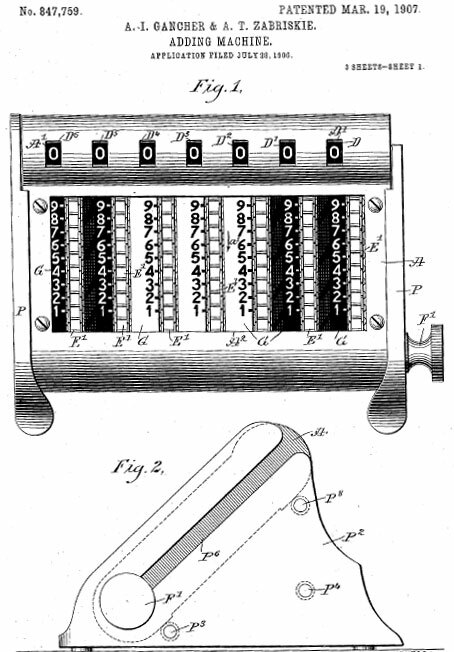 The first patent for this popular chain adder was established in 1899 in Germany (№DE121108) by Heinrich Goldmann (a.k.a as Henry Goldman) and his Arithmachine. As we know already from other stories in this site, the Jews are very communicative people, so during the next 10 years are issued 3 patents in USA and 4 in other countries—Canada, Switzerland, Austrian and England, granted to different people (see the lower drawing from US patent №847759, 1907, granted to Gancher and Zabriskie). The Golden Gem was introduced about 1907 by the Automatic Adding Machine Company, New York, and was based on the first similar patent in the USA, taken by Nobyoshi A. Kodama (patent №US753586). The company's advertising in 1917 claims over 100000 had been sold by that year. At that point they cost $10 each. The overall size of the device is 6.9 cm x 13 cm x 10 cm, and it was quite heavy, some 750 g. To operate the Golden Gem (see the lower photo), the stylus is inserted into a link corresponding to the desired number and pulled down. As the continuous chain revolves, it advances a number wheel whose value is seen in the window at top (see photo with cover removed below). When a wheel revolves from 9 to 0, a tens carry mechanism automatically advances the next wheel by one. (This works well, but advancing the tens carry on multiple digits at once (e.g. from 999 to 1000) requires some extra hand strength!). Subtraction is possible (via the 9s complement method) using the red numbers shown to the right of each chain. 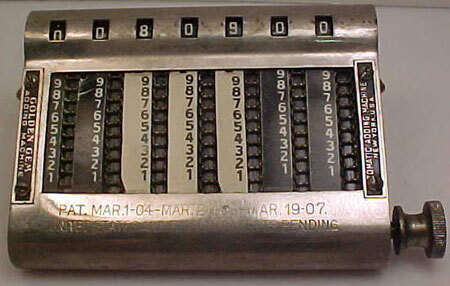 Clearing of the result register is achieved by turning the knob at bottom right until all digits show zero. Before WWI, Automatic Adding Machine Company of New York, tried to launch a portable and listing (printing) adding machine (sold for 50$) based on Gancher's patents US1047199 (from 1912) and US1178227 (1916). This machine however (see the nearby image) had no commercial success and very few of them survived until now. The moving force behind Golden Gem and Automatic Adding Machine Company was Abraham Isaac Gancher, a Russian Jew, born on July 13, 1875, who emigrated to USA in 1892, and initially worked as a leather salesman. Gancher and his wife, Rebecca (b. 1876 in New York), married in 1899. Abraham Gancher became interested in adding machines a few years later. He was also a small-handwriting specialist and had, apparently, procured himself a place in Ripley's Believe it or Not by writing the Bill of Rights on a postage stamp! Abraham Gancher died on 1 September, 1965, in New York.